All Smoky Mountain Model A Club members receive the monthly newsletter The Rumble Seat Reviewer. Each issue is packed with valuable information about the club including recaps and photos of recent outings, upcoming event calendar, technical tips, for sale and wanted listings, member features, and much more. 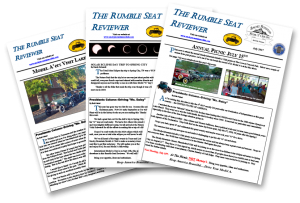 If you’d like to read past issues of The Rumble Seat Reviewer please click on the links below to download your PDF copy. Email us today to learn more!